You can click on the above to view and hear the recording of the Deminar. The second Deminar answers two questions. The first question “Why? (Why do I write so much stuff and why I am I doing these Deminars and setting up free worldwide access to generic loop and unit operation labs?) is answered on slide 4. The virtual plant used in these Deminars that creates a non DCS specific control room type experience is the most exciting thing I have done in years. This is either a commentary on my sedate existence or is an indication of the possibilities for an interactive opportunity assessment that could provide the knowledge and justification for process control improvements. The answer to the second question that is actually a list of questions on slide 8 about the source of oscillations that cannot be tuned out is, as you might expect, the subject of the Deminar. I think there are 8 main concepts not widely known that one can take away from this Deminar to provide guidance for a wide variety of applications. a. For a self-regulating process, integral action in any PID controller in the control loop will cause a limit cycle from stick-slip. In order to eliminate the limit cycle all PID controllers must have their integral action turned off either by a I-deadband setting bigger than the limit cycle amplitude or by using a structure with no integral action (e.g. “P on error, D on PV, no I”). b. For an integrating process, the limit cycle from stick-slip cannot be eliminated even if the integral action is turned off in all PID controllers. (2) The limit cycle amplitude from valve stick-slip is set by the process gain and hence cannot be altered by changing the controller gain. For nonlinear processes and nonlinear valve characteristics, the amplitude changes with operating point. (3) The limit cycle period from valve stick-slip is proportional to integral time. Slowing down the reset time will make the period larger. Thus to increase the filtering effect of process time constants in the primary loop or downstream processes, a tuning strategy would be to decrease reset time and if peak error for load disturbances is not important to decrease the controller gain to allow a further decrease in reset time. a. For a self-regulating process, a single loop with integral action will not develop a limit cycle from valve deadband. A cascade loop with integral action in both controllers will develop a limit cycle from deadband. c. For a runaway process (exothermic reaction) I expect the behavior to be similar to an integrating process but to a greater extreme (larger amplitude for limit cycle and larger offset for no integral action in PID controller) as seen in slide 2 of NonSelfRegulatingProcessDeadbandLimitCycle. The lack of process self-regulating in both integrating and runaway processes causes similar problems for a non-ideal valve response. (5) The limit cycle amplitude from valve deadband is inversely proportional to controller gain. (6) The limit cycle period from valve deadband is proportional to the integral time and is inversely proportional to the square root of the controller gain. (8) The offset created by the use of I-deadband or selecting a structure with no integral action is less disruptive to downstream processes because a constant load upset is readily corrected by downstream loops. Periodic disturbances are more disruptive and can be amplified if the period is close to the period of loops. An offset rather than an oscillation causes less interaction between loops. One of the ways to reduce interaction is to remove integral action and decrease the gain in the least important controller. The PID I-deadband setting should be larger than the maximum amplitude allowing for measurement noise. Note that the valve stick-slip and deadband will vary with time and operating point. The stick-slip and deadband is generally greatest near the closed position and when process material coats or corrodes the closure element seal, seat, and stem. Any addition of I-deadband or change in PID structure should be carefully monitored. Of course, the best solution is to correct the root cause of the problem and select a control valve per the “Best Practices for Valve Performance” on slide 27 of Deminar 2. 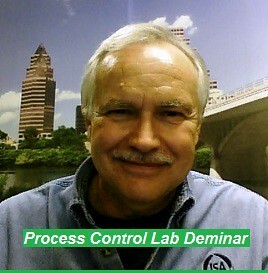 The next Deminar on “PID Control of Slow Valves and Secondary Loops” is set for May 12 Wednesday 1:00 pm Central Daylight Time.